The world's largest and most prestigious real estate fair, MIPIM 2017 will take place from March 14-17 in Cannes. For the first time, the fair will showcase Istanbul New Airport and Istanbul Airport City, which is expected to become a reference for the future of airport cities. The Istanbul Grand Airport (IGA) company plans to launch the Istanbul Airport City project, an urban development trade center project. Istanbul New Airport will have an operational capacity of 200 million passengers once completed, taking first place among the world's largest airports built from scratch. With the capacity to serve 90 million passengers, the first stage of Istanbul's third airport and Istanbul Airport City will begin operation in 2018. The airport city will include areas for hotels, offices, malls, social living areas as well as fair and event zones, all of which will work to revive the economy by offering new opportunities for employment. The first stage of the complex will be a 420,000-square-meter space with two more sections to follow, the East Part and the T2 Part. Once it is completed, the complex area will total 1.51 million square meters. "We believe that Istanbul Airport City will be a center of attraction, not only for airport visitors, but also for Istanbulites and the business world thanks to its large scale, diversified shops and offices," IGA Executive Chairman Hüseyin Keskin told Daily Sabah, adding that the project will also create employment and new investment opportunities alongside the airport's contribution to the economy. 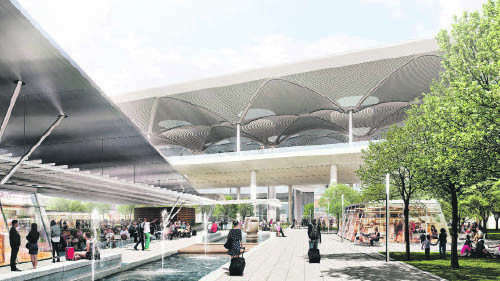 Keskin also explained that the center of Istanbul Airport City will be located near the main terminal and the parking garage, which will be constructed simultaneously with the terminal and will be surrounded by hotels, hospitals, offices and malls. Soon to be home to many local and international brands, the 24-hour mall will have a metro station located on its bottom floor. The Business Park in Istanbul Airport City will be a center for local and global companies. "Along with being a global aviation center, this far-reaching development project will become a trade center with A+ office facilities," said Keskin. "Istanbul Airport City will add value to the participating companies' reputation and will increase their performances thanks to functional, comfortable and luxurious offices in Istanbul New Airport," he added. 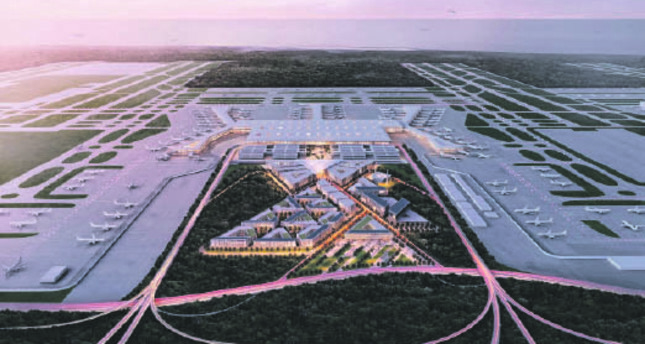 In the economic impact analysis report on Istanbul New Airport, the Center for Economics and Foreign Policy Studies (EDAM) said the airport will provide employment to as many as 225,000 people and make TL 73 billion ($20.40 billion) worth of contributions to Turkey's economy by 2025. Keskin pointed out that the airport will make significant direct and indirect contributions to the economy, not only with its construction, but also with its entire structure. As per the analysis report, Istanbul New Airport will provide employment to 225,000 people by 2025. The additional generated household income will reach $4.4 billion, and its contribution to the economy will reach approximately 4.9 percent of the national income, TL 73 billion. "These are the best-case scenarios. But even in a worst-case scenario — we call this a 'differentiated world scenario' — the airport's national income share would still reach 4.22 percent. 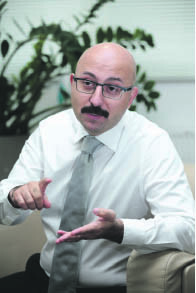 Even under the worst case scenario, it would make serious contributions to the economy," IGA CEO Keskin said. The report also indicates that the airport would provide opportunities for flights to more than 350 destinations for nearly 100 airline companies. According to the best-case scenario, as of 2025 a total of 120 million passengers, including 35.5 million domestic flights and 84.9 million international flights, are expected to be operated in and out of the airport. While the passenger traffic expectation was 120 million passengers in 2025, 69 percent of the passengers were expected to travel internationally, while 31 percent were expected to travel on domestic routes. Compared to other airports, Istanbul New Airport will surpass the Netherlands' Schipol and France's Charles de Gaulle, which lead in terms of contribution to national income. In fact, experts said that while Schipol Airport covers 1.1 percent of Amsterdam, Istanbul New Airport, once completed, would cover 1.4 percent of the city, which will create a new ecosystem, social spaces and a new demography in this region. The new airport's contribution to Turkey's gross national product (GNP) would vary between 4.2 percent and 4.9 percent in the worst and best case scenarios in correspondence to its ambitious size. In comparison, Schiphol airport, which represents more than 90 percent of the Dutch aviation sector, comprises about 3 percent of the Dutch economy. Given the fact that the aviation sector constitutes 3.4 percent of the global gross national product, and those working in the aviation sector account for about 4 percent of Netherlands' active labor force, the figures projected for Istanbul New Airport are quite realistic. This is an extremely important and non-negligible figure for a country like Turkey because its economic growth depends on the development of industry and trade since its adaptation of an export-based growth model. The first stage of construction of Istanbul New Airport is currently 42 percent complete, marking a significant milestone in the construction of the world's largest airport. Construction work at the 10.2 billion euro ($10.81 billion) project is currently at 42 percent, with the first phase expected to be finished in 2018. The third airport in Istanbul and the largest in the world, Istanbul New Airport will have the capacity to host 90 million travelers by the end of the first stage of construction and 200 million upon completion, making it the world's largest transportation hub on the largest plot of land ever designated for an airport facility. As previously reported, a new metro line that will connect Istanbul's third airport to the city's center and pass through Istanbul's six districts is being built by the Ministry of Transportation, Maritime and Communications. The construction of the 13-station metro line has an estimated cost of TL 4.9 billion.